I found this little gem while browsing the clearance rack at Books-A-Million this week or BAM as the chain calls itself. I love Michael Ruhlman. Check out his blog Michael Ruhlman – Translating the Chef’s Craft for Every Kitchen kitchen. I first discovered Ruhlman on my mother’s bookshelf. She had his “The Reach of a Chef,” in which he explores celebrity chefdom. If you are enamored of any famous chefs, it’s a must read. I also have Ruhlman’s book “Ratio,” in which he explains the formulas for making all kinds of food, like bread, cookies and cake and pasta. Ratio is a must read for seat of your pants cooks like myself who have trouble following recipes. I haven’t finished Ratio yet. 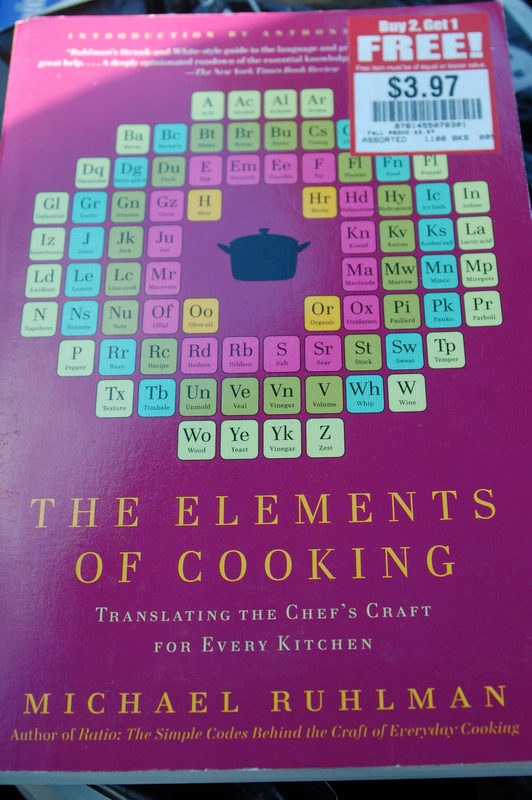 Anyway, when I saw Elements of Cooking on the rack for $3.97, orig. $15. I snapped it right up. I’ve just started in on the first chapter, which covers essentials like making stock and the importance of salt as well as a mini primer on the egg and a list of what Ruhlman considers essential kitchen tools. Then the book turns into more of a cooking encyclopedia, starting with A for acid and ending with Z for zester. Tags: celebrity chef, Michael Ruhlman, Ratio, The Reach of a Chef. Bookmark the permalink.